FEMA Responders often face daunting challenges during search and rescue tasks in dangerous environments. As such, the concept of including robots as a part of the responders' tool cache is being accepted, as robots have the potential of helping take responders out of harm's way and augmenting their capabilities. The Department of Homeland Security (DHS) Science and Technology (S&T) Directorate has initiated an effort with the National Institute of Standards and Technology (NIST) to develop comprehensive standards related to the development, testing, and certification of effective technologies for Urban Search and Rescue (US&R) robotics. These US&R robotic performance standards cover sensing, mobility, navigation, planning, integration, and operator control in order to ensure that the robots can meet operational requirements under the extremely challenging conditions that rescuers are faced with, including long endurance missions. Where appropriate, the standards will also address issues of robotic component interoperability to reduce costs. The US&R robotic standards effort focuses on fostering collaboration between first responders, robot vendors, other government agencies, and technology developers to advance consensus standards for task specific robot capabilities and interoperability of components. These standards will allow DHS to provide guidance to local, state, and Federal homeland security entities regarding the purchase, deployment and use of robots for US&R applications. The Department of Homeland Security has selected ASTM International as the development organization for the US&R robot performance standards. The work will be carried out under the E54.08 subcommittee on operational equipment within the E54 Homeland Security Application Committee. 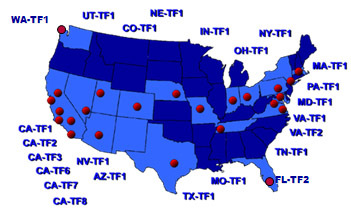 The Intelligent Systems Division of the National Institute of Standards and Technology is conducting an ongoing project, sponsored by the Department of Homeland Security Science and Technology Directorate and the National Institute of Justice, to produce a comprehensive set of standard test methods and associated performance metrics to quantify key capabilities of emergency response robots. These test methods address responder-defined requirements for robot mobility, manipulation, sensors, energy, communications, human-robot interfaces, logistics and safety for remotely operated ground vehicles, aquatic vehicles, and micro/mini aerial vehicles (under 2 kg/5 lbs) for urban environments. The goal is to facilitate emergency responder comparisons of different robot models based on statistically significant robot performance data captured within the standard test methods to help guide purchasing decisions and understand deployment capabilities. The test methods also support operator proficiency training and foster development and hardening of advanced mobile robot capabilities. These response robot evaluation exercises for FEMA urban search and rescue teams; federal, state and local bomb squads; and police/SWAT teams to introduce emerging robotic capabilities to emergency responders within their own training facilities, while educating robot developers regarding the necessary performance requirements and operational constraints to be effective. Emerging standard test methods and usage guides for robot performance are under development within the ASTM International Committee on Homeland Security, Operational Equipment (E54.08.01). These events help refine the proposed standard test methods and fixtures/props that developers can use to practice critical capabilities and measure performance in ways that are relevant to emergency responders. 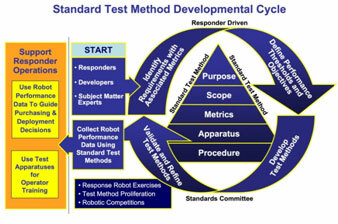 These events are conducted in US&R training scenarios to help correlate the proposed standard test methods with envisioned deployment tasks and to lay the foundation for usage guides identifying a robot's applicability to particular response scenarios.